Manifold to supply natural gas for in a high-performance economical system. How does the Multi-Cylinder Never M-T Refueler System work? capacity is 520 cf) for peak demand periods. The system can be configured with 2,3 or 4 cylinders. 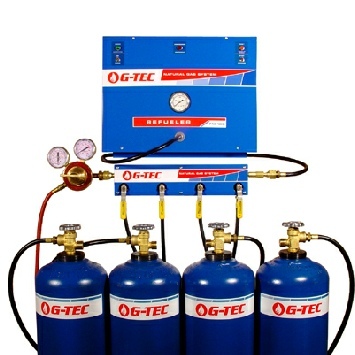 A Single Cylinder Never M-T System combines a G-TEC Refueler 60, NG-130 Adsorbed Natural Gas Cylinder, Regulator and a Simple Tee to supply natural gas in a high-performance economical system. How does the Single Cylinder Never M-T Refueler System work? Cylinder to 275 psi then turns itself off when the cylinder is full. When your torch is lit gas is drawn from the cylinder until pressure falls to 170 psi, then the Refueler 60 turns itself back on, refills the cylinder and again shuts off. The cycle will repeat over and over as long as the Refueler 60 is not turned off. Average gas flow capacity is 60 cf/hr and the NG-130 Cylinder holds 130 cf of gas for peak demand periods. How does a Never M-T Refueler System Work? 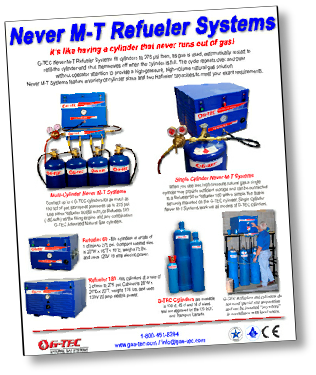 G-TEC Never M-T Systems use a Refueler and Adsorbed Natural Gas Cylinders to economically supply all the gas your torch needs, whether a lot or a little. 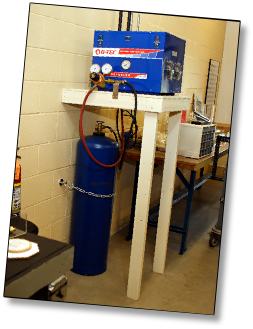 The Refueler system connects to a standard low-pressure utility gas pipe and fills one or more cylinders to 275 psi, then shuts itself off. 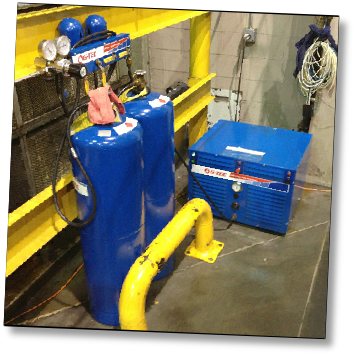 The cylinders use a regulator to reduce pressure from 275 psi to whatever pressure your application requires. When you light your torch gas flows from the cylinder(s) and as you work the gas level in the cylinders falls. At either 170 psi (Refueler 60) or 225 psi (Refueler 180) the Refueler turns itself back on, refills the cylinders to 275 psi then turns itself off again. Once started the process is fully automatic and will repeat over and over as long as the Refueler is not turned off - it is like having a cylinder that never runs out of gas. When is a Never M-T Refueler system a better choice instead of a Torch Booster? Torch Boosters are designed for applications like cutting plate steel, thermal spray and brazing where the gas requirement is steady all day, the torches use gas at about the same rate hour after hour. Since Torch Boosters do not store any gas they run all the time and must be sized for the highest gas flow the application might use. Other applications run in cycles and gas may be used in only a portion of the cycle. Thermal deburring and removing flashings from injection molded plastic parts go through a number of steps and gas may be required for only a few seconds in a 2-minute cycle. Other applications like scientific glassblowing normally use gas at low flow volumes but sometimes need high gas flow for just a few minutes. In these applications a Torch Booster would be running all the time even though gas is used only a small part of the time. You would need larger more expensive Torch Booster to meet a high flow demand that occurs less than 10% of the time. 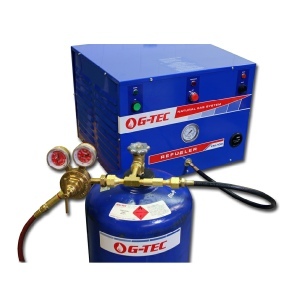 less expensive than the Torch Booster that would be required to supply peak gas flow volumes. periods of time a Never M-T Refueler System is the solution! Some torch applications don’t use a lot of gas most of the time, but sometimes need a lot of gas for a short time.